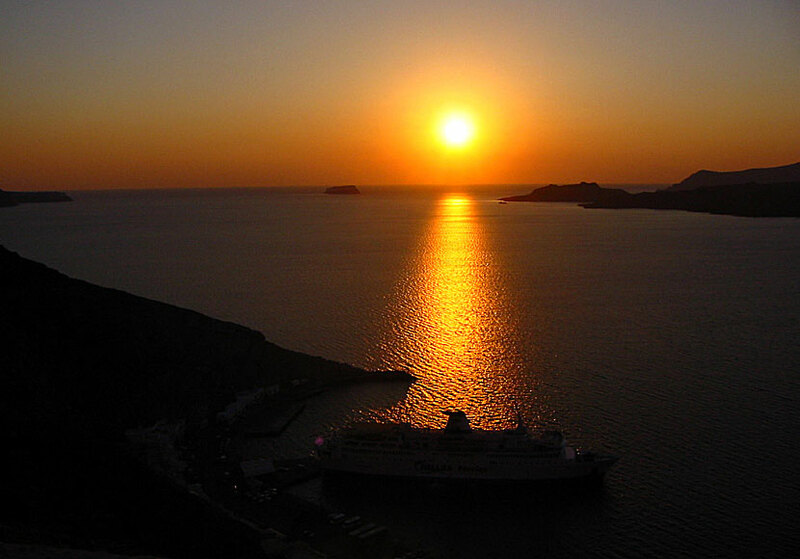 The legendary sunset of Santorini is said to be something of the most beautiful one can see. Many consider it should be witnessed from Oia where it should be particularly beautiful and glorious. You will notice that Oia has that epithet when you are waiting for the sunset, the village is filled to the brim with excited visitors each evening. No one will be disappointed, the sun goes down every night, just as it does in the rest of the world. It is something of an anticlimax when the sun disappears into the sea and it's all over, it is no doubt about the fact that the sunset is beautiful, but sunsets are always beautiful, no matter where the sun goes down. That is what I think. Sometimes the sunset can be magically beautiful. Personally, I find that the sunset in Oia is a little overrated. If I was able to sit there alone and slowly wait for the sunset, I would certainly appreciate it more. 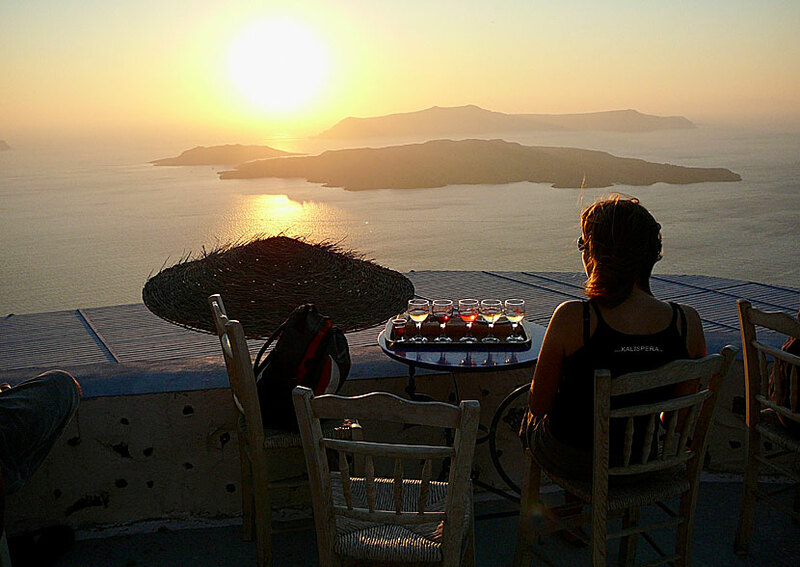 Because one is far from alone in Oia when the sun goes down. And after the setting of the sun it is time for everyone who does not stay in Oia to go home, and the traffic is no trifling matter. The sunset seen from Fira. 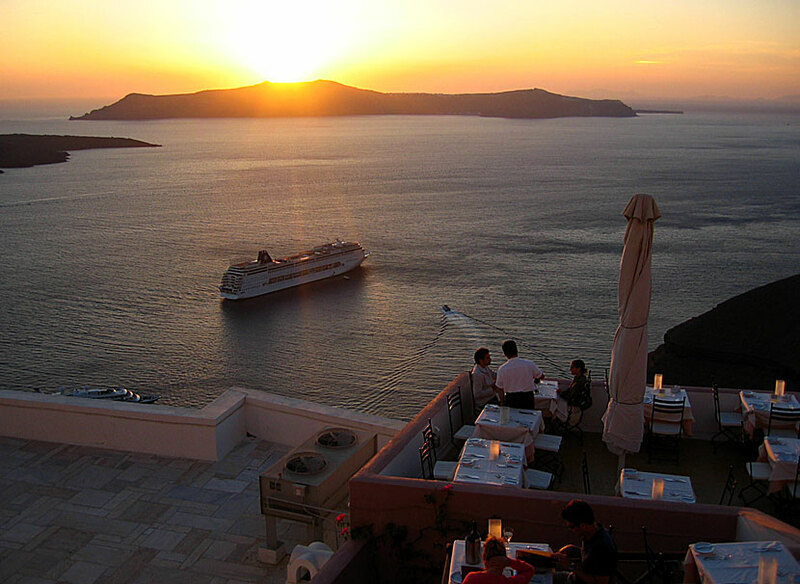 The sunset is naturally beautiful from many other places, including from Fira and Imerovigli. You can also go on a sunset cruise and experiencing the sunset on board. I think it's nice to sit down in a restaurant at the cliff edge in Fira, enjoying food and drink and watch the sun go down behind the neighbouring island of Thirasia. Meanwhile, one can fantasize about the volcanoes' destiny where they are brooding a few hundred meters below. My absolute favourite sunset is the one you can admire from Santo Wines. Santo Wines lies above the port of Athinios. Order a wine-tasting plate (six kinds of wine, cheese and crackers) and sit down and enjoy the sunset. It can not be more beautiful.